This year’s 66th Cannes Film Festival opened with a venerable love fest at the Jury Press Conference on Wednesday. Led by Steven Spielberg, this year’s panel drew an incredible mix of cinema talent Ang Lee, Nicole Kidman and Christoph Waltz, as well as Romanian director Cristian Mungiu and Scotland’s Lynne Ramsay. Spielberg and Lee admitted to the assembled press that they absolutely worshipped each other, despite being pitted up against each other at the Oscars this year. Although Spielberg said he was ready to judge, he claimed, “I look at this as two weeks of celebrating film, not two weeks of pitting one film against the other.” Those were kind words from the man who doles out the golden prize. But the truth is what we all really want to know is who will win the coveted Palme d’Or. With such a diverse jury it could be anyone’s game. The festival opened this year with Baz Luhrmann’s over-the-top 3D adaptation of Fitzgerald’s The Great Gatsby. A rainy red carpet welcomed stars including Carey Mulligan, Leonardo DiCaprio, Tobey Maguire, Amitabh Bachchan and Isla Fisher who were escorted under giant umbrellas up the steps of the Palais to pose for the hundreds of photographers assembled. The most common theme among this year’s Palme d’Or contenders is family, with Asghar Farhadi’s The Past, Kore-Eda Hirokazu’s Like Father, Like Son, Alex Van Warmerdam’s Borgman, Valeria Bruni Tedeschi’s A Castle in Italy, and Alexander Payne’s Nebraska all exploring this subject in depth. There are a few odd topics among the group, such as Mexico’s drug war, vampires, and modern day China. And while the Internet was trending with the Hollywood Reporter’s expose on $40K call girls at Cannes, it seems a bit comical that no less than three of the films in competition have the world’s oldest profession at the center of their narrative. We checked out the first contender, François Ozon’s Young & Beautiful Thursday night at the Grand Theatre Lumiere. The storyline involves a 17-year-old girl, played by model Marine Vacth, who decides to start turning tricks on the Internet, for no apparent reason. She later claims to get excited setting up appointments with older johns and meeting them in their hotel rooms for 300 Euros a session. But the excitement cannot be seen in her face. If acting today is non-acting, than Vacth is queen. But we’re not convinced. Vacth struggles to lose her gorgeous yet emotionless model pout throughout the film. She’s already being compared to Charlotte Rampling, but when the two are paired against each other in the final scene, it’s easy to see there’s no comparison in skills. 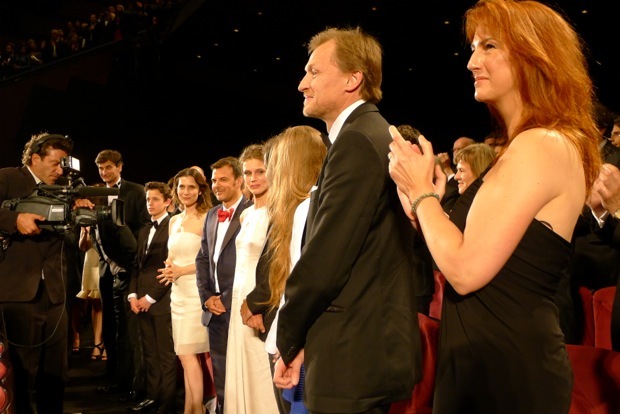 Director François Ozon (red bowtie) stands in-between his film’s stars Géraldine Pailhas and Marine Vacth. Thursday also saw the premiere of Ari Folman’s sprawling The Congress in Directors’ Fortnight, a half-animated, half-live action film starring Robin Wright and Danny Huston. Folman admitted that it was a dream to adapt one of his sci-fi heroes, Stanislaw Lem, onto the big screen. The film was no small feat, but Folman masterfully showed us a vast imaginative world worthy of Lem himself. Nicole Kidman takes a break from jury duty to attend the IFP CK party. Carey Mulligan in front of the cameras.